These mermaid drawings were a pleasure to produce even though I still have a lot to learn in regard to any type of portrait or anatomy drawing. 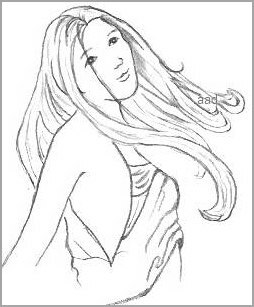 My mission was to design a mermaid outline and I did this when I had been drawing for almost 12 months. As the saying goes, "nothing ventured, nothing gained". As I've admitted to you before, I haven't quite perfected illustrating the human form yet, so I knew I had my work cut out for me here. By the same token, it's exciting to end up with a drawing that resembles the subject at hand. I did a bit of research to get ideas on very basic facial features. Study the face of this mermaid and observe how to portray a face without really having to know everything. This is what us beginners need to do so we can draw anything we set our minds to. I did lots of drawings of mermaids in outline form because I was trying to get the body proportions right. This task can be very frustrating if you allow it to be, but remember that you don't have to show anyone your starter sketches. Figure drawing becomes easier to understand as you get further into your learning. It depends on which subject you really wish to conquer and from there it depends on the depth of your desire to reach your goals. Start by drawing in some sketchy lines to indicate the posture and curves of the body and then build the drawing around those lines. Of course, if you prefer, you can use the blocks and cylinders method - there are many tools available to assist getting the figure right. You will discover all different methods as you browse this site but I used blocking in to successfully create some flower sketches so you only need to find what works for you. I hope you find these mermaid drawings are simple enough to inspire you and enjoy the pleasure of copying them. I have added a tiny bit of background to a couple of my images to lead you in the direction of creating different surroundings. It might help to make up a story for further inspiration. Fantasy is not my strong point but I decided to challenge myself to see if I can produce some reasonable mermaid drawings. A mermaid is a mythical creature that lives in the sea. Their bodies are half human and half fish. 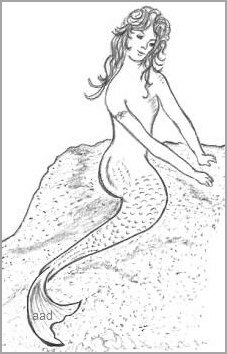 Mermaids are said to be beautiful and they try to lure men with their melodious voices and lovely hair. Sailors had to avert their faces so the mermaids wouldn't lure them and their boats onto the rocks. Mermen also existed apparently. I have to admit, I didn't come across any mention of mermen while I was growing up. However, I always did have a fascination for mermaids. 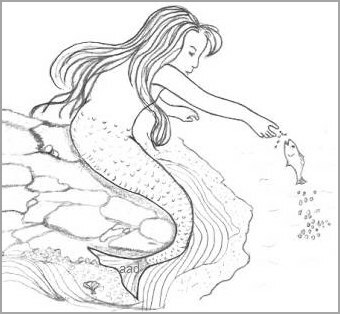 References to mermaids can be found in poetry or movies and there are some beautiful drawings of mermaids as well. Do you have your own sketchbook? By sketching consistently, you will improve all the time. I have a favorite mechanical pencil and I use it for a good majority of my drawings, including all images on this page. Even when you are in front of the television, practice drawing anything and everything on the screen. When you record shows, you can pause the scenes that appeal to you and then try roughly sketching it in your book. I also spend a lot of time scrutinizing profiles on tv but that's just a habit of mine because I'm trying to work out how to draw people in an easy way. If you start observing and practicing, you will successfully master mermaid drawings and anything else for that matter. Avoid making excuses for yourself by thinking that you weren't born with an artistic streak. If you have a desire to draw (like I do), you will be able to draw. All it takes is persistence, faith and practice. You will progressively improve with each and every drawing that you do. I know I've made that statement a million times but it's so true! Even when my drawings aren't very good, it doesn't deter me, I just move on to another subject and draw until I achieve satisfaction. This is the mindset you need to have if you want to succeed. "Never say die" is a good motto to remember. Just have fun and keep drawing!